Summer may have given way to autumn here in the U.S., but that’s no reason to put the grill away just yet. And whether you’re a seasoned grill master or just barely able to stack charcoal, Weber’s on the Grill from Weber-Stephen Products is sure to have something for you. From the very basics of grilling to more advanced recipes, there’s a little something for everyone. There’s two separate versions of the app, both of which cost $5—Weber’s on the Grill for the iPhone and iPod touch and Weber’s on the Grill for iPad. They’re both essentially the same with only a few differences. What’s For Dinner: Recipes on the iPad version of Weber’s on the Grill are as easy to follow as they are mouth-watering. Let’s focus on the iPad version. It has a great interface that makes navigating and using the app a pleasure. The app offers around 250 recipes organized into different categories like starters, red meat, seafood, pork, veggies, and desserts; you also can access recipes on rubs, marinades, and sauces. Tapping any of these categories brings up all the relevant recipes, complete with mouth-watering photographs. Each recipe offers detailed instructions, so even a novice cook can follow along. There are often links to in-app videos as well within the directions. The app allows you to add notes to any recipe, so if you need to tweak something with the recipe, you can jot it down. You can also mark a recipe as a favorite or e-mail it. And you’ve got the ability to instantly create a shopping list for any ingredients you need. Another great feature in the iPad version of On The Grill is its embedded timer. You can tap on cook times to automatically bring up a timer preset to that particular amount of time. What’s Your Beef: The iPhone version of Weber’s on the Grill offers the same recipes you’ll find in the iPad edition, though things are shrunken to fit the iPhone’s screen. I’ve talked up the recipes, but Weber’s on the Grill offers more than just that. It also features lots of good info and how-tos with everything from descriptions of proper grilling tools to tips on meat prep. The charcoal and gas grill basics sections provide some nice tips to get anyone up and ready to grill in no time. As mentioned earlier, several videos cover the basic recipes and techniques for burgers, steaks, whole chicken, and more. 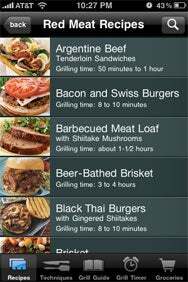 The iPhone version of Weber’s on the Grill provides the same recipes and information as the iPad version but on a more confined screen. The one real difference I noticed was the fact that the iPhone version featured a different kind of embedded timer. The timer was still there; you just had to set the time manually, which is no big deal. On the iPhone or iPad, Weber’s on the Grill is a really nice app for elevating your grilling game. It’s well designed, easy to use and chock full of great information and recipes.